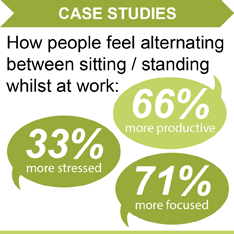 Active Working involves simple solutions to encourage standing and movement whilst at work. A Sit-Stand (height adjustable) work station is an excellent solution. It will enable you to simply alternate between sitting and standing as you feel appropriate. We propose mixing it up. 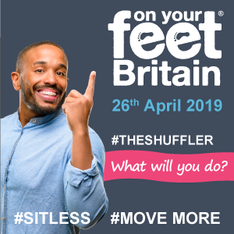 Try to stand intermittently at your Sit-Stand desk for periods of between 15 mins and two hours at a time Take breaks, walk around and mix it up every day. 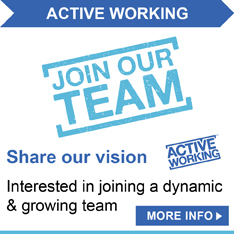 Try to get key leadership support within your organisation. Start your own campaign. It works! Educate your colleagues about the dangers of prolonged and excessive sitting. Create an environment that is supportive of change. Keep moving around. Take frequent breaks. Take phone calls standing up, this also boosts confidence and voice quality. Try removing tables and chairs from meeting rooms. This leads to shorter meetings. Walk to a colleague's desk, instead of emailing. Stand during presentations or speeches. Try taking a “Walking Meeting”.